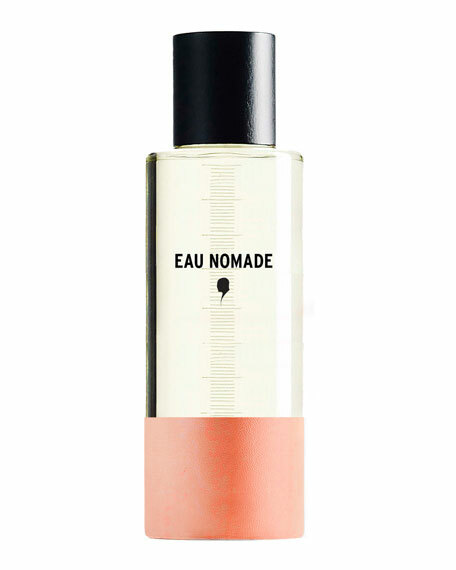 Eau Nomade by THIRDMAN: Extraordinary Freshness. Unprecedented comfort. For Man. For Woman. Splashed or sprayed liberally. Chilled or not. Individuality. Modernity. Freedom. A new attitude in luxury fragrances. Modernizing the long standing European tradition and craft of the Eau de Cologne, THIRDMAN introduces three exquisite scents to be splashed or sprayed liberally for sensorial pleasure everyday. Fragrances to 'live in.' THIRDMAN has created scents for well being that are meant to become part of a personal journey and lifestyle. Applied whenever, however, wherever, they introduce a new gesture in prestige perfumery: cooling, fulfilling, and free. 'Universal' scents. For man and woman, after shower, after sports, on the go; sprayed all over the body, on clothing or linens. Additionally the scents can be layered or chilled for even fuller pleasure. Bright, luminous, free. An abstract enveloping water with pure spices. For in-store inquiries, use sku #139779.